A nice clean mezzotint in a period frame. A full-length mezzotint portrait of Robert Manners, engraved by William Dickinson after the portrait by Joshua Reynolds and published in London in 1783. 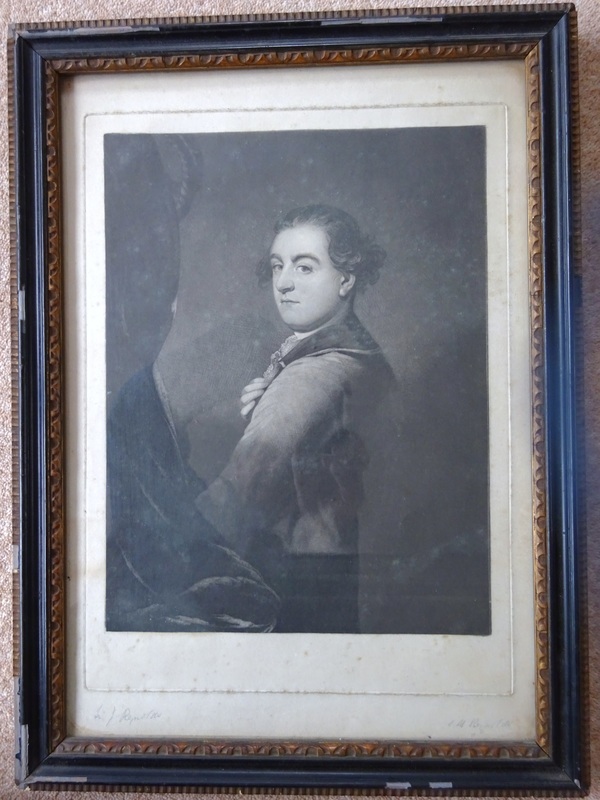 Robert Manners (1758-82) was the 3rd son of Lord Granby and Lady Frances Seymour. This portrait was posthumous and was commissioned by Lord Granby in memory of his son who died prematurely at the age of 24. Reynolds, writing to the Duke of Rutland's agent, describes the sadness surrounding Lord Robert's death: "....it is the general opinion that we have lost the most promising youth in the whole navy." 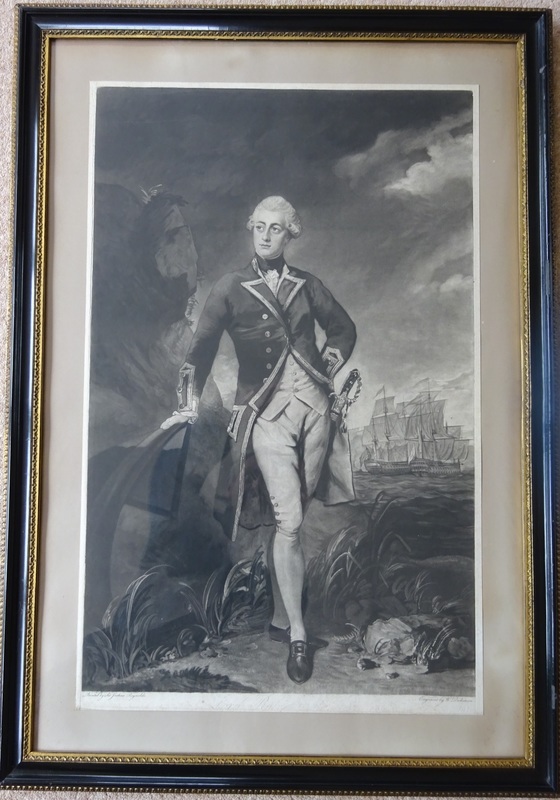 The finished portrait shows the young naval officer leaning upon an anchor with a maritime scene in the background. William Dickinson was born in London in 1746 and was awarded a premium at the Society of Arts in 1767, by which time he had begun engraving in mezzotint. His early work comprised mostly caricatures and portraits after R. Pine and was published by Carrington Bowles. By 1773 he had moved to Litchfield Street in Soho and was publishing his own work. By the late 1770’s he was working from an address in Henrietta Street, Covent Garden and it was from here that he produced mezzotints that rank amongst the finest ever produced, after artists such as Reynolds, Romney and Peters. In 1778 he embarked upon a partnership with Thomas Watson and moved to New Bond Street where he continued to produce the finest work and also developed into stipple engraving that was becoming fashionable at the time. After the death of Watson, Dickinson appears to have concentrated on printselling and he eventually emigrated to Paris where he died in 1823. A nice clean mezzotint with normal age toning. 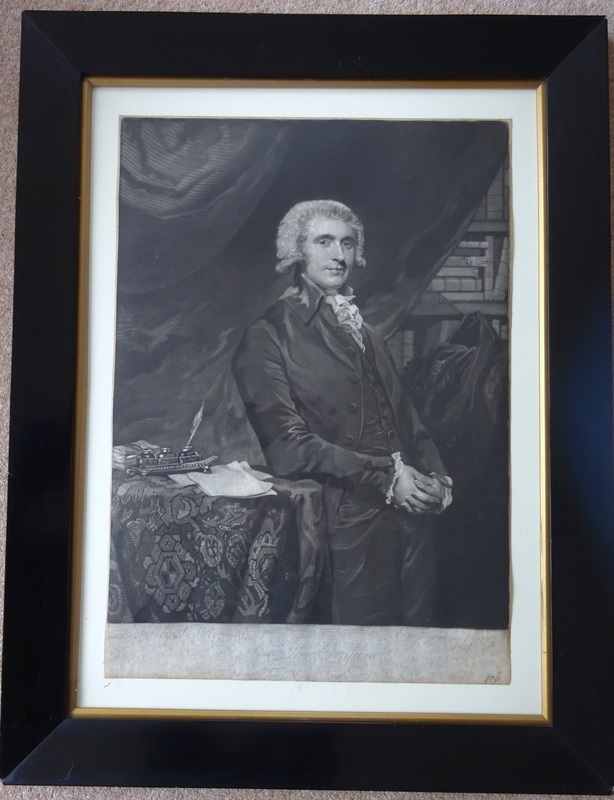 Portrait engraving after Sir Joshua Reynolds of Thomas Erskine, 1st Baron Erskine (1750-1823), Lord Chancellor of England. The three-quarter length portrait shows Erskine dressed leaning against a table upon which rest papers, inkwells and a quill pen. The engraving captures the fluid, painterly quality of Reynolds style. Erskine was a lawyer and Whig politician, serving as Lord Chancellor under Prime Minister William W. Grenville from 1806 to 1807. He made his name as a defender of political radicals and forceful advocate for freedom of speech and of the press during the 1790s. Notable cases include an unsuccessful defense of Thomas Paine for a seditious libel charge after publication of the Rights of Man (1791) and securing not guilty verdicts for the three co-defendants in the Treason Trials (1794). Erskine also represented Queen Caroline regarding her divorce in 1820. Sir Joshua Reynolds was the foremost portrait painter in England in the 18th century, and was extremely influential on later generations of artists. His poses were intended to invoke classical values and to enhance the dignity of his sitters. His style incorporated strong lighting, rich color and bravura paint handling. In addition to his portraits, he was known for history painting and genre scenes, called "fancy pictures" at the time. As first president of the Royal Academy in London, he significantly raised the profile of art and artists in Britain. Reynolds is also known for his eloquent Discourses on Art, delivered to the students and members of the Academy between 1769 and 1790. John Jones was a London-based engraver and printseller active from 1775. He was a mezzotint and stipple engraver mainly of portraits by Reynolds, Romney and others, and published most of his plates himself. He exhibited at the Society of Artists from 1780-91 and served as Engraver Extraordinary to the Prince of Wales from 1790-97. Inscriptions below image: Painted by Sr. Joshua Reynolds. Engraved by John Jones. Publish'd as the Act directs, May 13, 1790, by J. Jones, No. 63, Great Portland Street, Marylebone. ​Good condition for age ...normal age toning.